Being located in the rocky terrains of the Deccan plateau, the state of Madhya Pradesh is generously bestowed with various interesting physical features. One of such features is the caves found in the state. Add to that historical importance of the caves and we get ourselves the rock shelters of Bhimbekta. The name Bhimbekta loosely translates into ‘Bhima’s sitting place’. These rock shelters, located in Raisen district of Madhya Pradesh, are known for being archaeological sites from the Palaeolithic age, which was also known as the beginning of Stone Age in the Indian subcontinent. 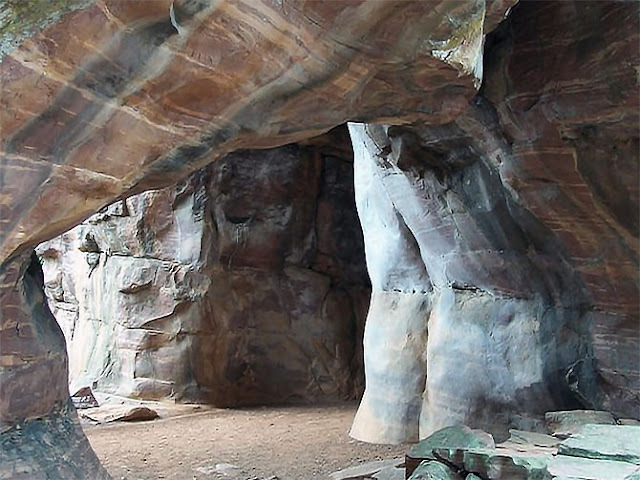 Located at a distance of about 45 kilometres from the city of Bhopal, the Bhimbekta caves are a famous exhibit of traces of earliest human life in India. The tourists can unwind in the resorts in Bhopal before undertaking this 2 hour journey to the rock shelters. Some shelters have shown signs of being inhabited by modern human species or Homo erectus about a hundred thousand years ago. As far as discovery of these rock shelters go, they were found around the years 1957-58 that too, by accident, when Dr. Wakankar, the archaeologist lost his way only to find himself amidst this hidden treasure of history. The Bhimbekta rock shelters act as a natural art gallery where paintings as old as thirty thousand years have been discovered. The lives of the pre historic people are etched in vibrant and clear paintings using colours from various sources like vegetables, which could fortunately stand the test of time, being drawn in the deeper sections of the shelters. This world heritage site has paintings from as many as seven different time periods ranging from upper Palaeolithic to medieval. Paintings from one time period inside the caves could be distinguished from paintings of other time period, since each had a set of specific characteristics. For instance, while paintings from upper Palaeolithic age are mostly linear representations in darker colours and larger animals like bison and tiger, paintings from Mesolithic era depicts smaller figures with stylized human beings as well as hunting scenes and other relatively elaborate depictions. The medieval paintings found in these rock shelters are rather decorative and seem to follow certain scheme in terms of colours. Not just rock paintings, Bhimbekta caves also boast of various other archaeological remains from the lives of the prehistoric past. With the most striking discoveries of various sharp and crude tools and weapons used by our prehistoric ancestors. Not just the prehistoric, the tourist can also find the undeniable influence of Buddhist monks on the rock shelter. These caves were likely used by the Buddhist monks as their stop over while they traversed the length and breadth of the country propagating their religion. There are many 4 star hotels in Bhopal that the tourist now can use as stop over before visiting this historical marvel of a spot. Bhimbekta caves is not just any other spot on your itinerary, it’s also a treasure trove of prehistoric artefacts and a natural wonder, a place really hard to miss out on.